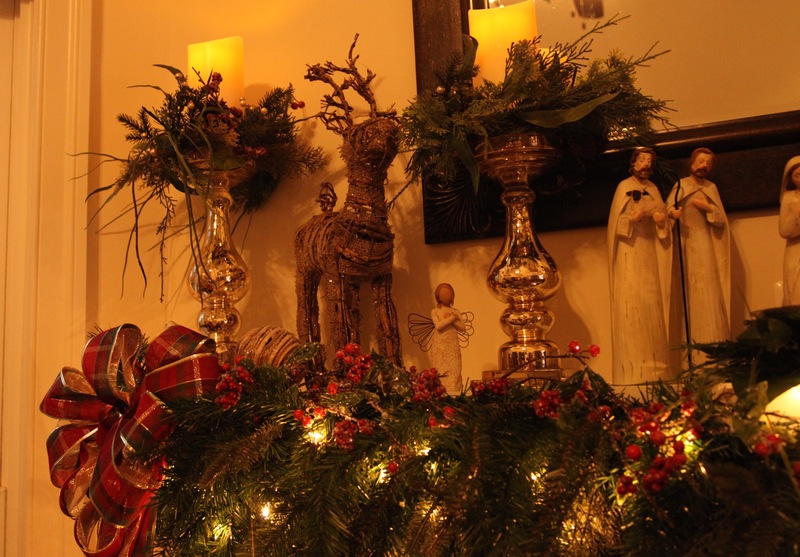 The “Tis The Season” attitude is still in full swing around this Southern home. 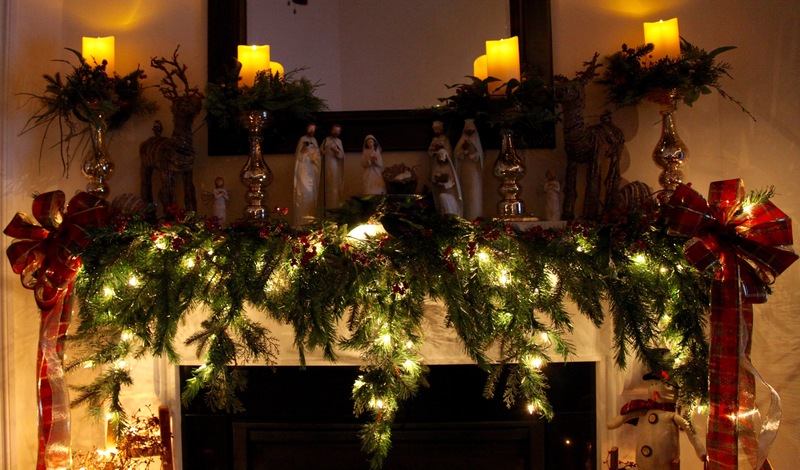 😉 Yes, I know, it is *still* way early to be doing Christmas decorating, but, considering how long it took me to pull this mantel and hearth together, it’s a good thing I started early. 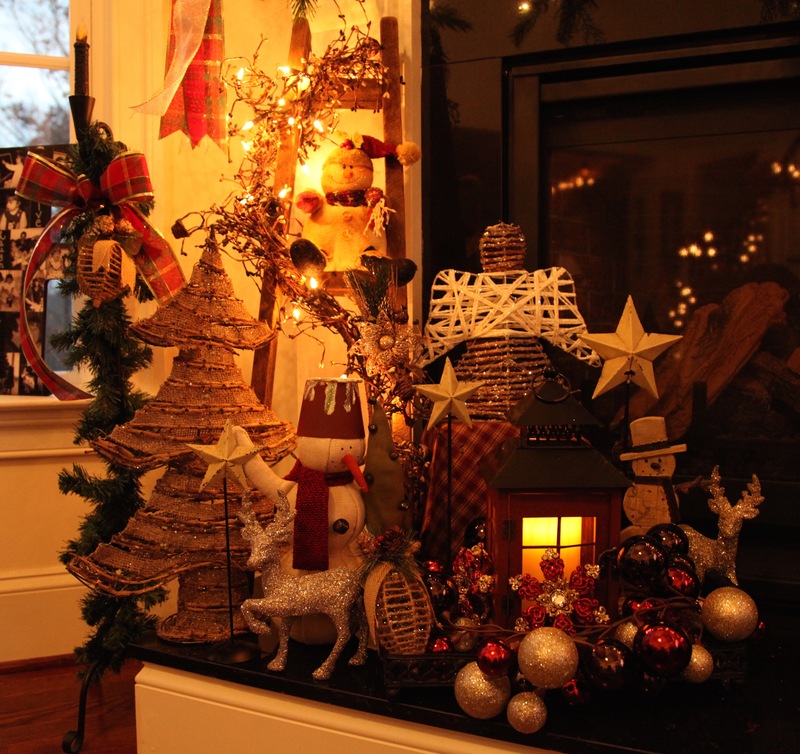 😉 I’m only half kidding, in years past, I’ve decorated with snowmen and only snowmen, and well, this year, in this new house, I wanted to do a little something different. I’ll still have snowmen scattered about here and there throughout the rest of my decorations because I’m not going to be recreating the entire wheel this year…which is what I had to do to the fireplace’s decor. 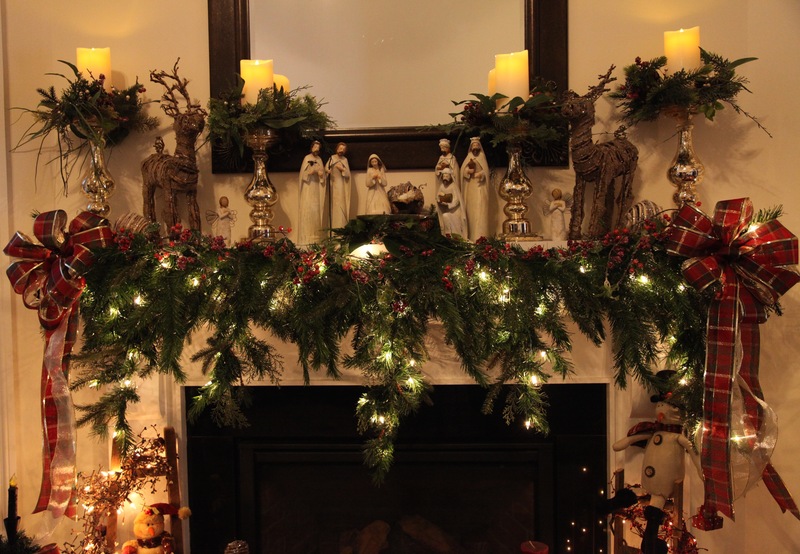 That gorgeous lit garland and those candle rings came from Grandin Road and yes, they were a bit pricey, but I had a coupon and free shipping, so in the end, they weren’t all that expensive. I purchased the gold mercury glass candle ‘sticks’ (they are quite tall and very sturdy– one is 14.5″ and the other is 13.5″) at Hobby Lobby for half off and the candles are Luminara, they are 3-1/2″ x 9″, and yes, they were rather pricey too although we got them off of Amazon.com for a better price than the Luminara site offers. It is worth a search around the Internet for the best price, they are amazing! I turn them on and off with a remote that came with them, if I chose to, I could set them to come on for 5 hours in the evenings as well and they’d automatically turn off. Those grapevine reindeer also came from Hobby Lobby for 50% off–they have fantastic sales on their Seasonal stuff. I made two bows out of burgundy plaid wired ribbon, they match the staircase decor. I purchased this Nativity scene at Hobby Lobby (of course) for half off $80, I love it so much because let’s face it, Jesus *is* the reason for the Season. I also love it because it mimics my Willow Tree angels and it completes the ‘feel’ that I was trying to accomplish on the mantel. 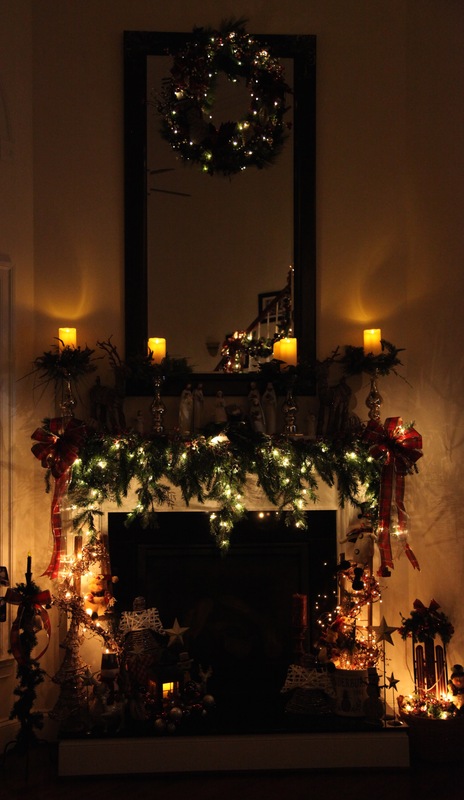 Now, the hearth, well that really presented me with another challenge because as I mentioned above, I didn’t want to recreate the entire wheel this year and my past years decorations were ALL snowmen. SO, I did purchase a few things. Working from back to front, which by the way is the way I create all my groupings, I wrapped that little rustic ladder with a small pip berry garland (I wrapped said garland with a 15 light strand). I sat a little stuffed snowman on one of the rungs of the ladder, and sat that burlap tree in front of and beside the ladder. 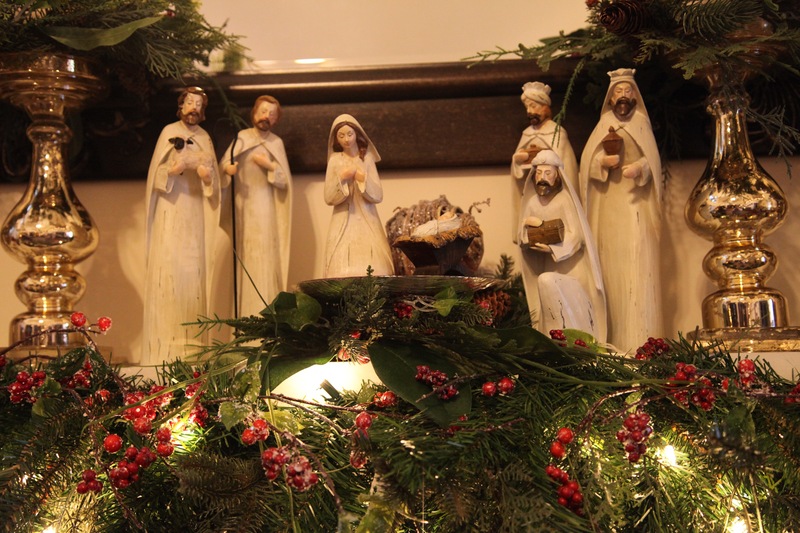 See that grapevine angel in the back, well, I wanted her to stand up higher in the back to add interest, so I used a burgundy and cream colored country napkin and covered a box for her to stand upon. I made the lantern decor utilizing the ornament garland that I had left over from doing the Staircase & Ornament Garland and adding a few Christmas ornaments for interest. I added a couple of snowmen, one burlap fella on the left and a wooden one that is just like the one that is up on the wreath on the mirror, and a couple of glittering reindeer. 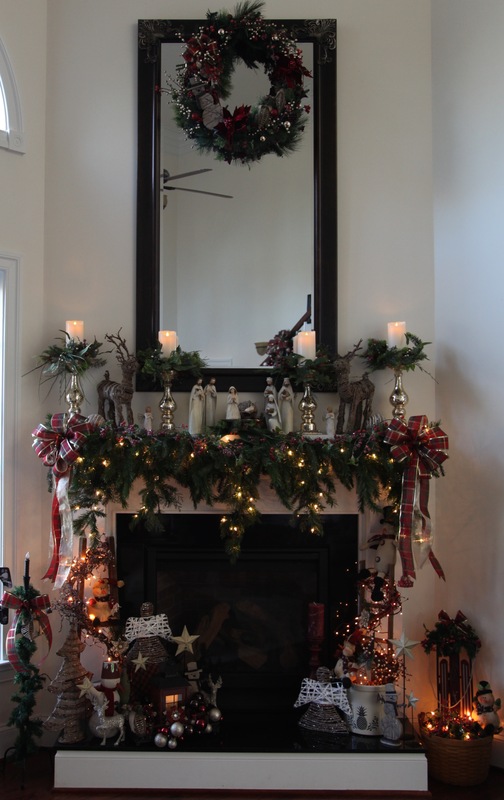 Here is the right hand side of the hearth, I made the crock decor simply by filling it up with “filler” <~~~whatever I can find that will take up room like an old towel, then I added a pip berry garland wrapped up in a bunch and stuck that on top. I took another pip berry garland and wrapped it around another rustic ladder. 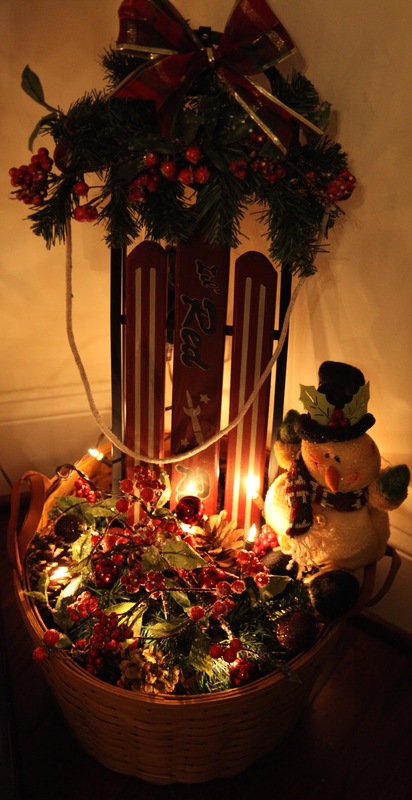 I then added Willow Twig Garland mini lights around the ladder garland, and then placed the remaining lights into the top of the crock on top of the pip berry garland. 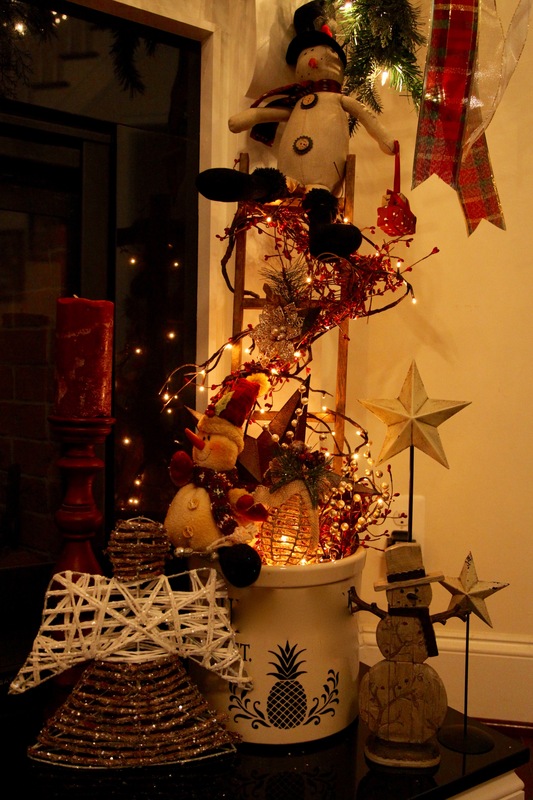 I stuck a big metal star in at an angle, added some gold berry beads and a snowman on the crock and another up on the ladder and called it done. 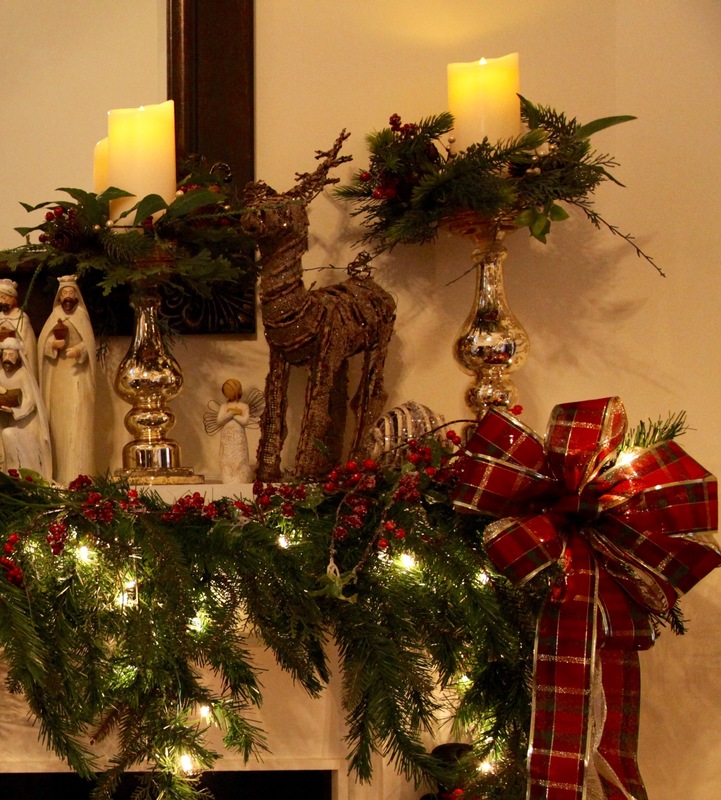 🙂 Again, I built the rest of the grouping from the back to the front, tallest to shortest adding the burgundy candle stick and candle, angel, another wooden snowman that matches the one in the wreath on the mirror. 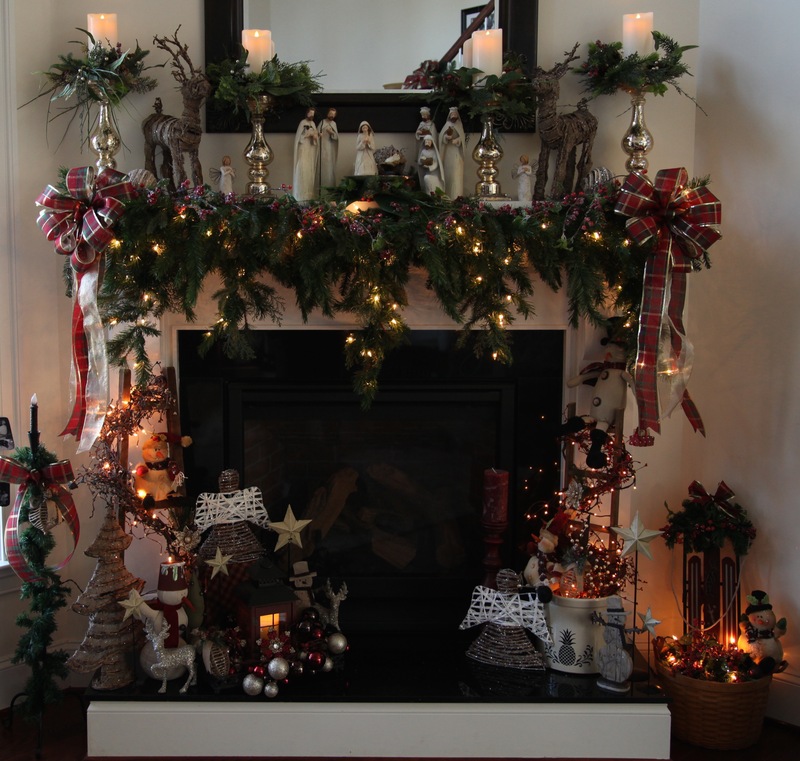 I scattered cream colored metal stars around the entire hearth to help to pull everything together.